eBay is awash with makeup brushes but it can often be hard to tell which to go for and which to avoid. Thankfully I've purchased quite a lot of makeup brushes from eBay now so here are a few of my recommended picks and some recent buys that I'm hoping won't disappoint! 1. Pro Multipurpose Face Brush (£1.88 here) - First up a new purchase that I have my fingers crossed with! I picked up this bargain brush as it instantly reminded me of the fairly new Bare Minerals Perfecting Face Brush that's a staggering £24.00. With a similar fluid reservoir the brush allows for a no-mess foundation application directly from bottle to brush! I'm eager to try this out now! 2. 10 Piece Kabuki Style Brush Set (£6.85 here or larger brushes 99p each here) - This was one of the first brush sets I purchased on eBay and was immediately blown away at the quality and softness. The incredible price works out at only 68p per brush which is just amazing seeing as I've had my own brushes for over 2 years now and they're still going strong. 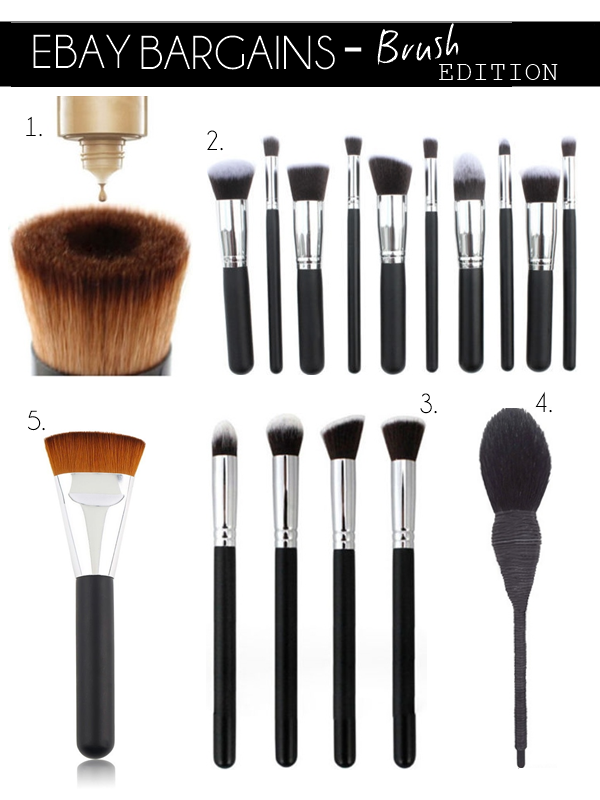 Though if you don't fancy the entire set (10 brushes is a lot!) you can find the larger brushes at only 99p each in the above link/listing. 3. 4 Piece Blending Brush Set (£3.18 here) - Still raving about the above set you can find the eye brushes from the 10-piece set in the link above. For a mere £3 you receive 4 amazingly soft eye brushes that don't seem to shed at all! I personally use them for blending eyeshadow and one to blend out concealer with - it works a dream! 4. Pro Kabuki Brush (£2.58 here) - Another recent buy here and again one that I had to pick up as it looked like such a perfect dupe for the pricey Nars Kabuki Artisan Brush (£43!!!). I've yet to receive it but again I have my fingers crossed that it will be a lovely brush to use with powder highlighter or for light contouring. 5. Flat Contour Brush (£1.65 here) - Lastly another recent buy but one I'm just got my mitts on and can report it's a good un'! Unlike any other brush in my collection this is a dense but super soft contouring brush, perfect for getting the powder or cream onto the face and then blending with a larger fluffy brush. Very pleased I picked this up! If you have any suggestions for themes of upcoming eBay Bargains I'd love to hear them in the comments below!